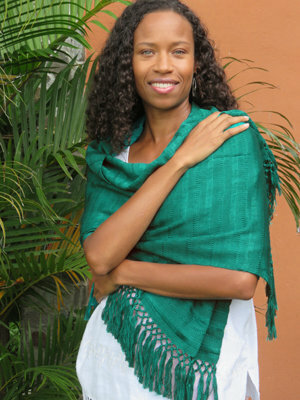 Our solid color 20” Wide Scarves/Shawls are hand-woven on a back-strap loom by our Manos Cruceñas artisan weavers. These scarves are so wonderfully soft against the skin you won't want to take them off! What's not to love?! Each large wrap is a generous 20" wide so you can wear it as a scarf or shawl. The perfect accessary! Each of our 20” scarves is finished with a fine hand-knotted fringe. Choose from 5 textured solid colors: aquamarine, emerald, gray, melon, and navy blue. 20" x 73". 100% rayon. 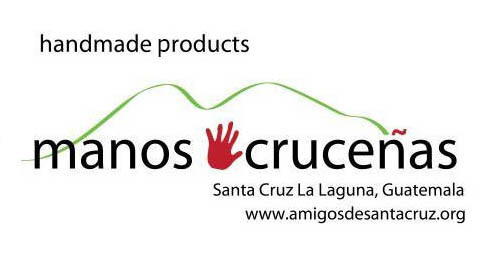 Each Manos Cruceñas product that you purchase will be accompanied by a tag with the artisan's name who made it! Backstrap weaving is a tradition practiced for generations by indigenous artisans in the highlands of Guatemala. Representations of women using backstrap looms can be found in ancient Mayan art and it is also present in Mayan folklore. According to mythology weaving originated with the moon goddess Ixchel who is often depicted seated at a backstrap loom. Walk through any indigenous town in Guatemala today and you can see women weaving in their home during breaks from other daily work. One end of the loom is attached to a post or tree using a rope and the other is attached to the weaver's body through a strap that wraps around the back giving the technique its name. Most women begin learning to weave around 7 years old. The backstrap weaving technique is employed by 24 of our artisans to create elaborate textiles for sale in our store. It is also part of the daily lives of most women who make clothing and other textiles for use in the home. Textiles vary by community and designs and colors are often indicative of a specific village. In Santa Cruz those colors include deep red, yellow, purple and blue with specific shapes representing the volcanoes towering over Lake Atitlan. Clothing and textiles produced on a backstrap loom reflect community pride. They identify each woman as an individual within her culture and her community as well as communicating traditional Maya beliefs about the universe.